Online betting has exploded in the last decade as technology has improved and the internet has evolved from a luxury to a necessity. Many countries around the world exhibit differing approaches to the legality and regulation of online gambling and the Brazilian authorities have typically demonstrated a restrictive approach in the last fifty years or so. However, have times changed, and can citizens of Brazil freely place bets online? We take a look at the top sites where Brazilians are placing their bets. Being a country synonymous with sporting success, it is not surprise that Brazil has maintained a strong gambling culture throughout the centuries. Betting and competition go hand in hand and up until the end of the Second World War, gambling was legal in the largest country in South America. When the Social Democratic Party were elected, a change of approach was implemented, with the vast majority of forms of gambling being banned. Shortly after, betting activities were prohibited even further, with the all traditional casinos made illegal, leaving just the lottery and horse racing as a medium through which individuals could speculate. Even prior to World War II in 1941, all unregulated sports betting activities had been made illegal under the Criminal Contravention Act. This legislation, albeit amended, is still active today. When the internet really started taking off just after the turn of the millennium, the Brazilian authorities, like many, were ill equipped to deal with censoring and regulating their citizens’ online betting activities. Obviously the advances in technology which resulted in this new medium for wagering, could not have been accounted for, and it soon became a cause for discussion within the Brazilian government. Keen to gain control, the government first produced a bill which aimed to outlaw online gambling in 2008. This failed, and was followed by another unsuccessful attempt in 2009 to force Internet Service Providers (ISP’s) to ban gambling websites. Unperturbed, Brazilian authorities again tried to control affairs in 2010 by attempting to pass a bill which blocked Brazilians from conducting financial transactions with online gambling operators. This again failed, but in 2011, the government took the first real steps towards banning online sports betting by passing a legislative proposal which suggested prohibiting the use of debit and credit cards to place bets – be it online or offline. On the surface this appeared a counterproductive move with the World Cup 2014, a massive income generator, so close. However, there was an exemption offered, which enable betting on federal sports lotteries and other games offered by Caixa Economic, the Brazilian bank that has also branched out to betting. As with many countries, the regulatory environment remains cloudy. 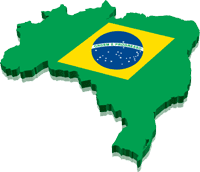 There are no licenced Brazilian sports betting operators, but international online bookmakers have clearly seen the huge potential for business in Brazil. After all, with a population pushing nearly 200 million people and an estimated 45% of those having access to the internet, Brazil has one of the strongest foundations for online gambling. So Can I Get A Bet On? Absolutely. As mentioned, these online bookmakers want a piece of the Brazilian pie, and have made their sites friendly for customers logging in from Brazil. For instance, major European bookmakers Unibet, Betsson and MarathonBet are very accommodating, offering the option to deposit on their website using Brazilian Real (BRL) currency. The vast majority of bookmakers provide a translation of their websites into Portugese, and Unibet go one step further, giving customers the ability to view the different odds and markets in Brazilian Portuguese. Interestingly, established firms Coral and Bwin do not accept sign ups from Brazil. Bwin had previously taken on new registrations, but a policy to reduce their presence in South America saw a change of approach. However, current customers are allowed to continue with their betting activities. Betsson really seem to be targeting clientele from South America and not only do they provide translation and the facility to deposit in Brazilian Real (BRL), but they also entice new custom by dangling out a first deposit bonus of R$150. With the confusing climate regarding using credit and debit cards to fund betting accounts, Brazilian customers may wish to err on the side of caution and utilise alternative payment methods, of which there are plenty. It is estimated that 80% of Brazilians use national payment methods, and most of the large scale bookmakers are tuned into this. Boleto Bancario is the most popular medium through which Brazilian customers can make secure payments to online betting sites. Boleto Bancario facilitates the movement of funds from bank accounts to other businesses and does not require a credit/debit card. Bookmakers that provide this portal for payment are Betsson, 188bet, Betfair and William Hill to name a few. Other similar deposit options such as AstroPay (a virtual pre-paid card) and Kalibra/Postepay are accepted by the major firms, as are global e-wallets such as Skrill, Paypal, Neteller etc. Despite the legislation regarding debit and credit cards, sites such as William Hill still give the option to deposit using a bank card. Bank wiring is also a popular method and is a safe and fast process when using an established bookmaker. It goes without saying that football is the most popular sport in Brazil. Hosts of the 2014 World Cup, the national team are five time world champions and have produced some of the best players to have ever graced the planet. The domestic league Seria A attracts fervent support and fosters some of the up and coming starlets who learn their craft before typically moving to Europe to secure lucrative contracts at top clubs. Martial Arts and particularly MMA have an increasing presence in both recreational and professional sport. Made famous by Royce Gracie, Brazilian Jiu Jitsu is now the discipline that underpins the fighting styles adopted in the UFC. Regular MMA events are held around the nation and there is the option for Brazilian citizens to bet on their heroes fights’ as they have a strong representation in the UFC (increasingly popular discipline with bettors). Basketball is another sport which attracts attention and is the third most popular in Brazil. The national team have performed well in international competition, having won the World Championships twice, achieved three Olympic bronze medals, in addition to regularly winning the Pan-American games. With endless miles of sandy beaches, it comes as no surprise that Brazil excels at volleyball. Both the Men’s and Women’s teams are ranked number one in the world and participation rates across the country are high. The horse racing industry in South America (in particular Brazil and Argentina) is large. There are currently around 1400 registered Thoroughbreds in Brazil and the race that attracts the most attention and betting activity is the Grande Premio run each year in São Paulo. As horse racing is one of the few legal forms of gambling, it receives plenty of interest from those who like a flutter. Despite the best efforts of the government, online gambling seems likely to expand further in the forthcoming years. A large, tech savvy population leave bookmakers salivating at the prospect of new customer and profits, and it appears that firms are attempting to be as facilitating as possible, providing translation, bespoke promotions and Brazilian currency options. Stringent implementation of a prohibition on debit and credit cards is unlikely to deter many, as the number of e-wallets and alternative payment methods make it extremely difficult for the Brazilian government to control betting activity. Nations with rich sporting heritage are invariably house a gambling culture and Brazil is no different – it would make sense for the government to accept online betting and try to regulate it so they could also benefit. Either way, Brazilian citizens look set for continued choice of bookmakers and offers as betting firms try to exploit the potential of the country.